PhilCare believes that the path to wellness goes beyond having an effective health care coverage or an immediate access to medical providers. To be truly healthy means taking the time to enjoy life’s little pleasures while ensuring that you are protected for medical emergencies at all time. 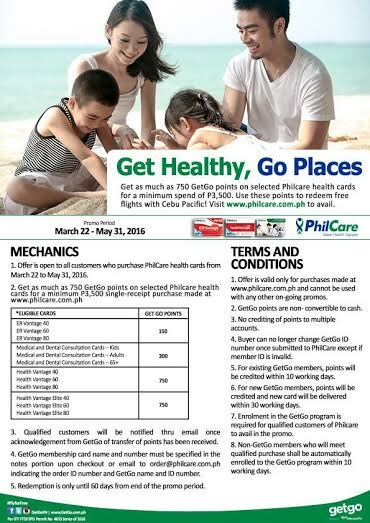 This is the vision behind PhilCare’s latest partnership with GetGo Rewards by Cebu Pacific, a lifestyle program that allows card holders to accumulate points on everyday spending and redeem these points for free flights. GetGo points can be earned from buying groceries, paying utility bills, refilling the car with gasoline, and now—even when taking care of your health.